Which are the common problems of digital direct UV LED print on plastics for long-term run? What sets a UV LED printer apart from different printing technologies is the unique UV curing technology. What is UV curing technology? UV curing is a photopolymerization process that uses UV energy to change a liquid to a solid. The UV LED printing technology refer to a non-impact, inkjet printing technique that instantly cures or dries jetted ink droplets directly onto the printable substrate. It’s amazing what a single UV LED printer can produce. A LED UV print system gives the possibility to print on various materials, such as plastic, and on different kind of products: plastic items, acrylic awards, small plastic desktop signs, plastic watt meters and industrial labels, acrylic key chains, plastic packaging, custom plastic cards, plastic blank media cases for CD and DVD covers, plastic smartphone accessories to many other plastic derivatives items. The ability to function at optimum levels, even during long-lasting and high volume printing jobs with consistent quality output, makes UV LED technology an effective printing solution. However, it can happen sometimes to experience a print failure even on a seemingly working system. The flying inks which will stain the materials with some small ink droplets. All of the digital printers are delivering the colors by piezoelectric technology which is firing, shooting out, and instantly solidifying the inks during the direct printing on the substrates. However, there are some ink droplets randomly spraying or splashing due to the air while the printer is on. This will create dust and make the ink system dirty and the print head also. This could shorten the printer head durability. The static electricity from materials which will over spray the artwork. Surface static charge is also the cause of many common printing defects. What’s causing the static electricity and ink over spraying? The power of the static electricity interferes with the ink direction while printing, pulling the ink particles away from their intended trajectories causing printing defects including over spray. Static electricity is generated by an unbalance between the molecular construction of relatively non – conductive insulators such as plastics, paper, glass, ceramics and other non – conductive materials. 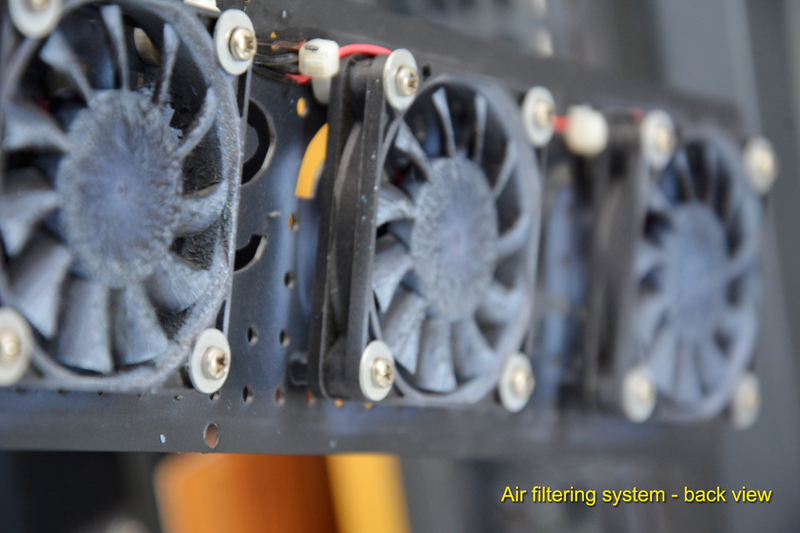 Not only can these particles land in the wrong places, but they can also be pulled back toward the printhead, which can cause clogging of the printhead. HOW ARTISJET SOLVES THE ABOVE FACTS AND WHICH ARE THE BENEFITS? Filtering system to absorb the floating droplets to eliminate the ink dust. Equipped with a professional filtering system near to the carriage (about 7 cm), the artisJet digital UV LED direct plastic printers are minimizing the dust generated by the inks. This translates into longer life of the whole ink system and delivering clean and clear prints. Anti – static system to neutralize the electricity from the materials and ensure the 100% ink droplets direction. 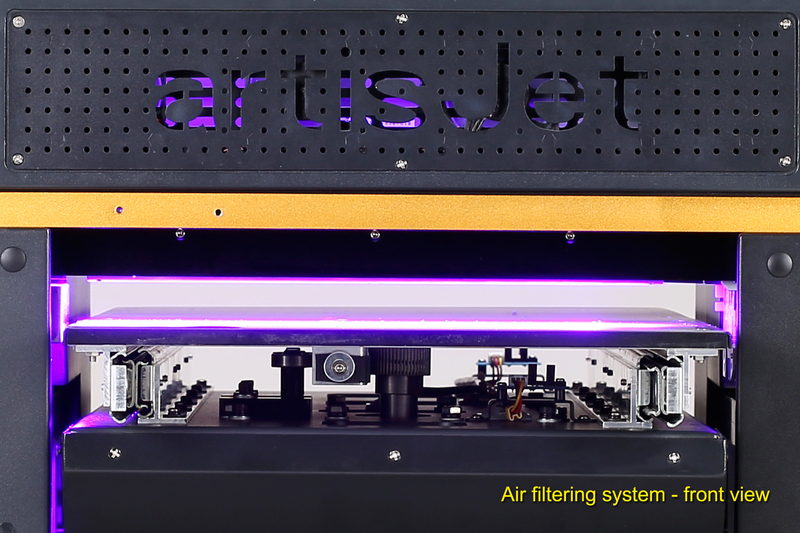 Installed in the materials loading port 2 cm before the start of printing, artisJet electrostatic rods can produce a large number of positive and negative air mass charges, through ion radiation area of the object on the charge and then neutralize it. When the surface of the object is negatively charged, it will attract the positive charge in the radiation area; when the surface is positively charged, it will attract the negative charge in the radiation area so that the surface of the static electricity is neutralized. UV LED systems require very little space and are easy to integrate into small spaces. The UV LED printers produce no ozone emissions or hazardous waste concerns, which makes it eco-friendly printers and safe to operate even in crowded places such as public print shops, digital stores, shopping mall kiosks etc. Don’t let over spraying, dust and static electricity interfere with the printing workflow and lower the production. Fortunately, there are solutions for taming and removing these aspects while printing. Just find which artisJet UV LED flatbed printer is suitable for you and what works best to meet your printing requirements. Feel free to request a sample to discover the printing capabilities of artisJet digital direct printing systems. Subscribe to artisJet YouTube channel for printing solutions videos, learn how to use artisJet printing software to achieve different outstanding print effects, discover video testimonials and maintenance video support to much more. What is Digital Direct to Garment Printing? As the name suggests, Direct to Garment Printing, also known as DTG printing, digital direct to garment printing, is a process of printing on textiles and garments using specialized or modified inkjet technology. The two key requirements of a DTG printer are a transport mechanism of the garment and specialty inks that are applied to the textile directly and are absorbed by the fibers. DTG uses specialty water-based inks, which are absorbed by the fibers of the garment. Know the Garment Printing techniques. Which garment printing method is better? What to compare. DTG printing versus screen printing, DTG printing versus heat transfer printing etc.? When it comes to printing a design, picture or logo on a garment, there are a number of methods. Screen printing, heat-applied transfers and now dye sublimation are widely used garment decorating techniques, but none truly compare to the capability of a DTG printer. With dye-sublimation garment printing, the image is first printed onto a release or transfer paper, then placed in contact with a polyester textile under high heat and pressure. The heat causes the ink to sublimate, than turn from a solid to a gas and bond/transfer to the garment. The heat transfer printing method applies custom designs to items like T-shirts or tablecloths through a process that uses a combination of heat and pressure. The technique of printing images on garments using stencils and screens dates back to ancient China, screen printing has transformed over the years, but even in its present-day form, the process involves a blade or squeegee pushing inks through a stencil covered mesh or screen. Digital Direct to Garment Printing. DTG prints can look as good as or better than traditional apparel printing processes, such as screen printing. The amount of time & labor involved with digital DTG printing is significantly lower than traditional methods. Textile DTG printers using inkjet technology are attractive because the process of creating a printed garment from scratch using traditional technologies can be long and complicated. DTG printers for textile printing makes garment design and printing simple, accessible and cheap, especially compared to traditional screen printing. With a textile direct to garment printer you have all the ingredients for an exciting new business model. • Most color garments can be printed onto – DTG printing provides the potential to print onto virtually any color of garment, so you can create the design that you really want. • Wide range of applications such as T-shirts, caps, sweatshirt, ties, personalized footwear like socks, tote bags and more. • Water based garment inks and pigmented inks which are non-toxic and environmentally friendly, it has an excellent color fastness, high elasticity and non-cracking attributes, while the CMYK + White white inkjet technology gives outstanding vibrant prints on light and dark garment. The white ink channel makes printing on dark substrates way easier, producing high resolution quality prints both on cotton and polyesters. • DTG printing system is widely used in small quantity printing business and customized high-end garments business. • Various on demand printing plates to ease the printing process – easy print in low cost and no limit for the order quantity to your customers. • Direct to garment printers generally require a specialized software package called a Raster Image Processor (RIP) to print properly. Modern RIP Software, also generates the white ink under base required to print on dark garments (for example black T-shirts), controls the amount of white and color ink laid down and color matching as well as other functions such as multi-shirt image placement and ink cost calculation. • The process of direct to garment printing is simple. c) Print and Sell – let the printer do its work – then heat press and sell. The technology is a revolution and stimulation in this field, bringing new colors and vitality. DTG printing systems are available to handle all pre- and post-treatment to produce personalized/customized fabrics, T-shirts, sportswear and other items of clothing and accessories, such as baby clothing, hats, bags, napkins and towels – on demand. If you want each T-shirt to be different and you want them printed in a four-color photographic digital printing process using a compact DTG desktop printer is really your only cost effective option. If you are interested in short runs, prototyping, T-shirt printing or customized garments, the possibilities available to you are about to get very interesting. Want to know more about DTG printing with artisJet printers? Check the artisJet DTG printers’ portfolio. Feel free to request a sample to discover the DTG printing capabilities with artisJet. artisJet ink system refers to a whole system installed in the artisJet direct to substrates printing machines. It’s a complex system and at the same time very simple to follow. The ink system has multiple parts, each one with a specific functionality: to pump, transmit, filter, fire/shoot out, wipe/clean the ink as well as storage the wasted ink. Moreover, the ink system has a self - automated maintenance functionality. Ink containers (ink bottles). It refers to the ink tanks displayed in the form of ink bottles or refillable cartridges. artisJet is applying the open sourcing small ink bottles (1) with a volume capacity of 200 ml of inks for each ink color for continuous ink supply system (2). WHY? In the first place, because is easy to refill inks at a low cost for the machine user and their continuous production with portable loading, filtering and refilling system. The second main reason of choosing accessible and refillable ink containers is that the small ink bottles will avoid decantation of the ink sediments if the ink will stay in the bottles for a long time. That is why, it is recommended to use the inks within 45 days, and otherwise the TiO2 from the LED UV ink will settle down gradually affecting the ink quality and also the entire ink system. The ink consumption is very low in artisJet digital direct to substrates printing systems. We need only 30 ml of all inks combined for each printed square meter. To understand better, a printed square meter can be translated into about 130 IPhone 6 mobile covers with full printing coverage. There are few operation tips for the ink containers: to replace or clean the ink bottles every 3 – 5 months and to avoid spraying when refilling the ink bottles and to follow the operation menus. Ink pumping (or ink pump / ink service station). The ink pump (3) refers to a system that suctions the ink from the containers and it will direct the ink into the entire ink system via a motorized pump (4) with the spongy cap top (5) connected to the printer head (6) using vacuum power. The entire pumping system is structured as it follows: pump motors, cap tops and plastic frames. A pinion gear of the pump motor rotates in the clockwise direction and the ink is suctioned. The cap tops unit is designed to make airtight in the cap sticking fast to the printer head surface so that the ink suction can be performed by the driving force of the pump unit. When the printer is in standby status or is power off, the cap unit prevents the ink from thickening. Operation tips for ink pump: keep practicing the cleaning of the cap top by automatic cleaning and replace the cap top every 3 months. Ink transmitting (ink tubes). These refers to a system or a part that makes the path for the ink delivery to the printer head. artisJet applies 3*2 mm of dark plastic tubes with a standard length of 1.5 meters protected by the ink tube tank (7). One end of the ink tubes is connected to the ink tanks (8) and the other one is connected to the damper (9). Each ink tube has a number code (10), from 1 to 8 in the situation of an 8 ink channels printer (C, M, Y, K, W, W, W, W) as artis 3000U LED UV printer is. Ink filtering (ink dampers). It refers to a part connecting the ink tube to the printer head, containing the inks and filtering them before the last step to ink firing. The dampers (11) are made of plastic with foil filtering matt inside (12). The black port of the damper makes the connection with the printer head (13), while the ink tubes are fixed on the golden ports of the damper (14). The ink filtering is installed on the carriage and it moves with it. There is one damper for each color. Ink firing. This is the part of the process when the colors are fired to the substrate. The printer head is the one responsible with shooting the inks onto the printing materials and it is placed on the carriage cart. The functionality of the ink firing process is based on the mother board. Before firing ink to start a printing process, a nozzle checking must be done. The purpose of nozzle checking and head cleaning is to check that all the colors can print well and this way you can keep the ink system work properly. Ink wiper and ink cleaning. The ink wiper (15) is a part of the ink system that is made from silicon rubber. 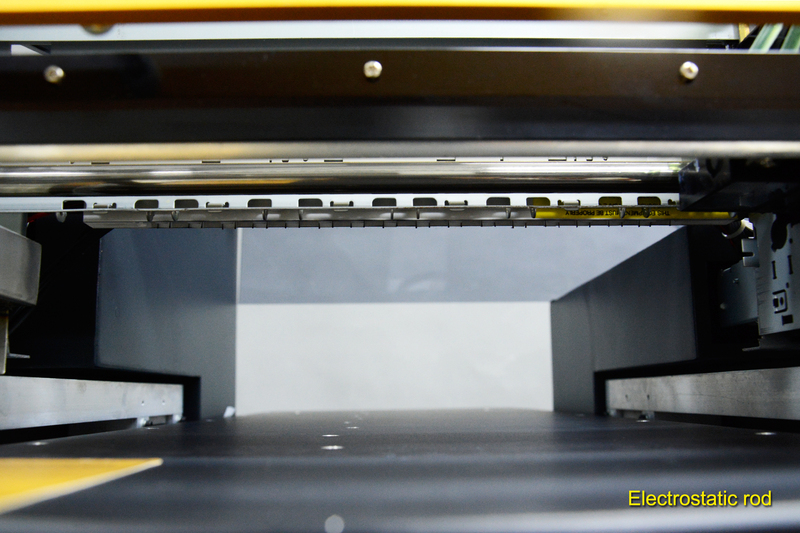 The wiper is installed nearby the ink pump and its role is to clean the wasted ink during the printing process on the mirror side of the printer head. Wasted Ink Tank. During the pumping and printing process, the wasted ink is stocked into an ink bottle (16, 17). Ink system maintenance modules. There are two ways of safe maintenance of the ink system. One way is the self – automated maintenance module or automatic cleaning functionality (18) which refers to a system that powers the ink system maintenance on demand when the user is away. Another way of doing the cleaning maintenance is manually. Whether you are new to digital LED UV printing or an experienced user, this article aims to help you in understanding better the artisJet LED UV ink system. But first, there are few points we have to highlight regarding artisJet LED UV technology. Flash On Ink Firing System. One of the most important features is the Flash on Ink Firing System (FOIF) which makes the LED UV printer to electronically activate only the UV LEDs when the ink is fired. As a result, the printer head lifetime is maximized and it lasts up to 8 months of continuous operation. The UV LED module can last up to 25,000 working hours. FOIF helps to protect the whole ink system at the same time including the ink pump, wiper, dampers and cap tops. Control On Demand System (COD) and LED UV curing. Designed for flexibility and simplicity, artisJet COD system is digitally controlling the UV LED curing mode to adapt for different substrates and working environments. The LED UV curing is a technology that has been advancing in the last few years and is considered as the best available on the market today. artisJet LED UV Continuous Ink Supply System. CISS Ink Systems are designed to offer quality printing results without wasting time by changing cartridges. The continuous ink supply system is made of refillable ink tanks that are connected to the printer head until the ink is shoot out to the printing materials. Unlike the traditional ink cartridges which often requires replacements, the CISS allows the 100% utilization of the available inks making it suitable for high volume applications, therefore is cost saving. The printer head, which is the one responsible with shooting the inks onto the printing materials, it is placed onto the carriage cart. The waste ink tank contains the waste ink accumulated from printer head during print. Benefits of LED UV CISS ink system. When it comes to printing industry, the LED UV curing helps your business to move away from adverse and harmful toxic drying methods. Enjoy the many improvements by moving towards safer and eco-friendly working environment. A LED UV system is a game changer and a main characteristic is the instant curing of the inks, so there is no need for drying time or powder. Moreover, you get the possibility to print on various materials, without constraints, even on heat – sensitive substrates and achieve high-end printing effects on plastics or any other material that don’t absorb inks. What is UV LED Print Technology? A system allowing the DIRECT digital prints onto all materials with instant drying speed, 3D embossed / textured printing results, sharp color performances, strong color durability and eco-friendly features. How it works? UV stands for ultraviolet, while LED is the shortcut of Light Emitting Diode; the UV wavelength is from 1 to 400 nm, where the UV LED printing systems are using 365 – 395 nm. The name of the UV LED printer is given by the ink type, the DTS3 and DTSAT3 LED UV inks that artisJet systems are printing with. The UV LED lamps cure the digital pictures, letters, numbers printed from the printer hardware immediately during the print and change the liquid into solid substrates. What are the main features of UV LED print? With its unique drying method from the UV LED lighting, the UV LED printing technology offers an instant dry during the digital print process. Due to its strong compatibility to wide range of materials, the UV LED print technology enables the direct print onto all type of products. Another characteristic of this technology is the stability on the white inks, which allows the direct print on dark and light materials. The instant drying feature allows a layered, textured and 3D embossed printing result. Without the VOC inside of the inks, the UV LED print technology is eco-friendly. What are the advantages of artisJet’s UV LED print technology? Long life of UV LED lamps with wave length of 365 and 395 nm and 12,000 working hours is one of the main advantages. The flexible UV LED power adjustment for different materials printing on demand, the built-in liquid cooling system for safe and continuous printing production, as well as the piezo equipped with anti-static print system for high resolution digital direct printing makes the UV LED technology stand out. Another advantages of printing with LED UV technology is the wide range of products with different printing sizes and speed for all business levels and the low cost maintenance yet with high ROI (return on investment) on artisJet CISS system. Moreover, DTS3 and DTSAT3 inks allow the printing on both rigid and flexible substrates. That is why artisJet provides not only a printing business, but a business training as well. customized phone cover printing (www.instacase.com, www.gocase.com.br, www.skinkin.com, www.hairyworm.com); personalized wood frame printing (www.woodpost.com, https://www.etsy.com/shop/WoodLifePrints?ref=hdr_shop_menu); PVC card printing (www.ownster.uk); dial face for meters and watches (www.cromptonusa.com, www.bjpinghe.com); trophy, awards and plaques (www.sportsfort.com, www.uniontrophy.com); promotional items (www.image-code.net, www.impressionsdpa.com, www.istersouvenir.rs); balloons, toys and play around (www.balloonmonkey.co.uk, www.picsolve.biz).